Hello friends! This week has been a doozy as I've been extra busy with Fox & Hound Photo gearing up for our halloween events this weekend. We're really excited to work with a local businesses, and we'll be at the Orpheum Children's Science Museum in Champaign IL tomorrow from 1-6pm for their Halloween Spooktacular, as well as at the Savoy rec center on monday from 6-8pm for their Trick or Treat Street event. It's been getting steadily cooler around here, and many of my friends and I have been commenting on the definite fall crisp that has set in in the air. The jury is still out as to how I feel about this impending cold. One thing's for sure, this shoot is the last one I'll be doing for a while that I'll be able to get away without tights for. It's just getting too cold friends. Bring on the festive socks and cute tights! 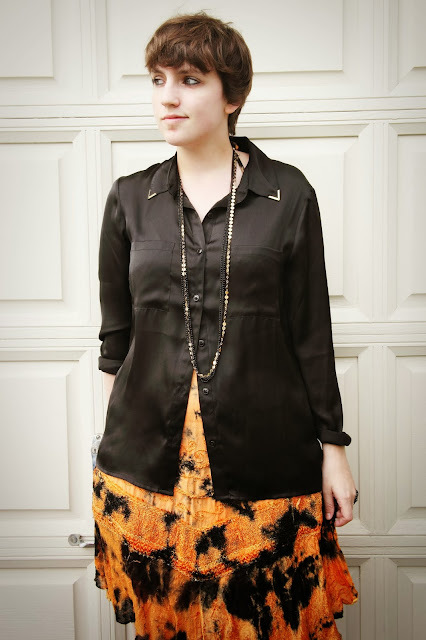 Forever 21 silky black button down. I've been looking for the perfect black sleeved item to wear with this dress for a while, and I thought I'd try this out. While I think I might be able to find something that would pair with the dress a bit better if I go out and search more in the world, I don't think this is too shabby. It brings in a touch of gold with the collar clips, so that's always a positive in my book. 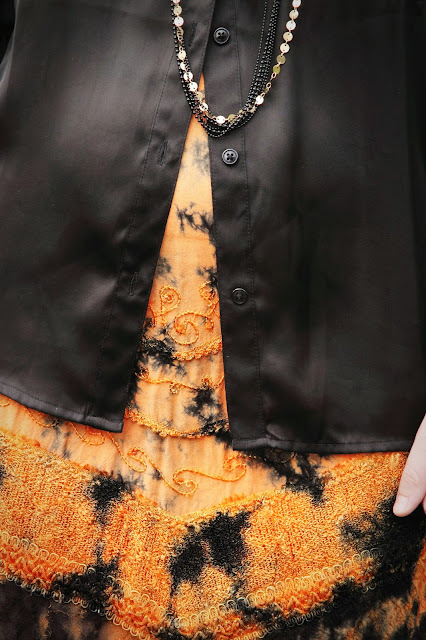 Orange and black tie dye dress. 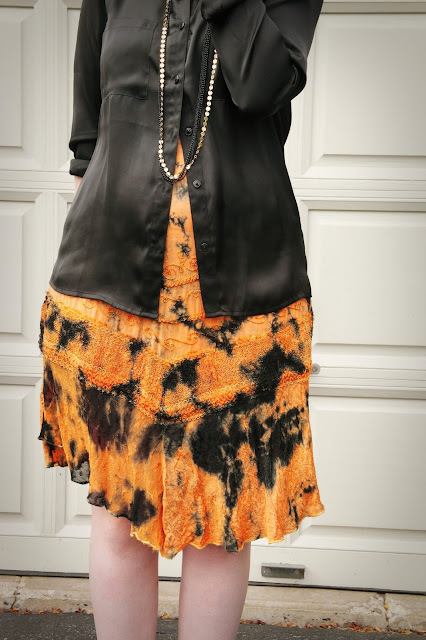 I've had this dress for a couple years and have always struggled with styling it. As previously mentioned, the color orange and I have had a distant relationship over the years, and I find it a difficult color for me to wear. Due to the season however, I knew it was time to take on styling this dress. Steve Madden heels. Congratulations, Goodwill. You win again. Forever 21 black and gold necklace. This necklace tops off the outfit with another touch of gold, really driving it home for me. How have you been dressing for the season?